The universe is out of control, in a runaway acceleration. Eventually all intelligent life will face the final doom ”the big freeze." An advanced civilization must embark on the ultimate journey: fleeing to a parallel universe. In Norse mythology, Ragnarok ”the fate of the gods” begins when the earth is caught in the vice-like grip of a bone-chilling freeze. The heavens themselves freeze over, as the gods perish in great battles with evil serpents and murderous wolves. Eternal darkness settles over the bleak, frozen land as the sun and moon are both devoured. Odin, the father of all gods, finally falls to his death, and time itself comes to a halt. Does this ancient tale foretell our future? Ever since the work of Edwin Hubble in the 1920s, scientists have known that the universe is expanding, but most have believed that the expansion was slowing as the universe aged. In 1998, astronomers at the Lawrence Berkeley National Laboratory and the Australian National University calculated the expansion rate by studying dozens of powerful supernova explosions within distant galaxies, which can light up the entire universe. They could not believe their own data. Some unknown force was pushing the galaxies apart, causing the expansion of the universe to accelerate. Physicists went scrambling back to their blackboards and realized that some “dark energy” of unknown origin, akin to Einstein’s “cosmological constant,” was acting as an anti-gravity force. Apparently, empty space itself contains enough repulsive dark energy to blow the universe apart. The more the universe expands, the more dark energy there is to make it expand even faster, leading to an exponential runaway mode. In 2003, this astonishing result was confirmed by the WMAP (Wilkinson microwave anisotropy probe) satellite. Orbiting at a million miles from earth, this satellite contains two telescopes capable of detecting the faint microwave radiation which bathes the universe. It is so sensitive that it is able to photograph in exquisite detail the afterglow of the microwave radiation left over from the big bang, which is still circulating the universe. The WMAP satellite, in effect, gave us “baby pictures” of the universe when it was a mere 380,000 years old. 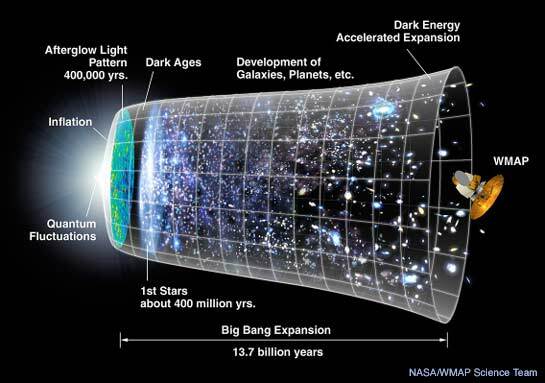 Timeline of the universe: The expansion of the universe over most of it's history has been relatively gradual. The notion that a rapid period "inflation" preceded the Big Bang expansion was first put forth 25 years ago. The new WMAP observations favor specific inflation scenarios over other long held ideas. 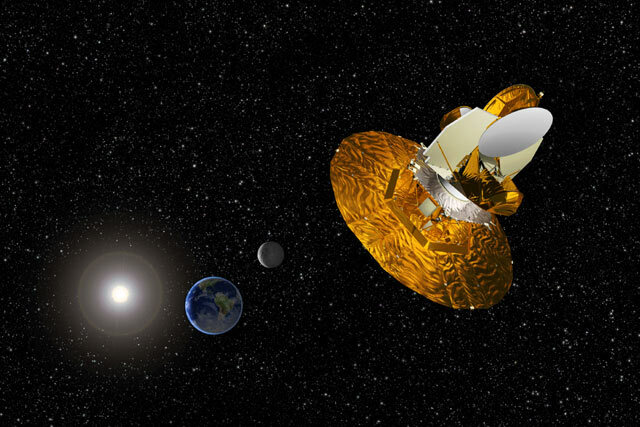 The WMAP satellite settled the long-standing question of the age of the universe: it is officially 13.7bn years old (to within 1 per cent accuracy). But more remarkably, the data showed that dark energy is not a fluke, but makes up 73 per cent of the matter and energy of the entire universe. To deepen the mystery, the data showed that 23 per cent of the universe consists of “dark matter,” a bizarre form of matter which is invisible but still has weight. Hydrogen and helium make up 4 per cent, while the higher elements, you and I included, make up just 0.03 per cent. Dark energy and most of dark matter do not consist of atoms, which means that, contrary to what the ancient Greeks believed and what is taught in every chemistry course, most of the universe is not made of atoms at all. As the universe expands, its energy content is diluted and temperatures eventually plunge to near absolute zero, where even atoms stop moving. One of the iron laws of physics is the second law of thermodynamics, which states that in the end everything runs down, that the total “entropy” (disorder or chaos) in the universe always increases. This means that iron rusts, our bodies age and crumble, empires fall, stars exhaust their nuclear fuel, and the universe itself will run down, as temperatures drop uniformly to near zero. Russell wrote this passage in an era before space travel, so the death of the sun does not seem so catastrophic today ”but the death of the entire universe seems inescapable." So on some day in the far future, the last star will cease to shine, and the universe will be littered with nuclear debris, dead neutron stars and black holes. Intelligent civilizations, like homeless people in rags huddled next to dying campfires, will gather around the last flickering embers of black holes emitting a faint Hawking radiation. Although thermodynamics and cosmology point to the eventual death of all life-forms in the universe, there is still one loophole. It is a law of evolution that, when the environment changes radically, life must adapt, flee or die. The first alternative seems impossible. The last is undesirable. This leaves us with one choice: leave the universe. Although the concept of leaving our dying universe to enter another seems utterly mad, there is no law of physics forbidding entering a parallel universe. Einstein’s general relativity theory allows for the existence of “wormholes” or gateways connecting parallel universes, sometimes called “Einstein-Rosen bridges.” But it is still unknown whether quantum corrections make such a journey possible or not. Although once considered a preposterous idea, the concept of the “multiverse” - that our universe coexists with an infinite number of parallel universes - has recently generated much interest among physicists from several directions. First, the leading theory consistent with the WMAP data is the “inflationary” theory, proposed by Alan Guth of MIT in 1979. It postulates a turbo-charged expansion of the universe at the beginning of time. The inflationary universe idea neatly explains several stubborn cosmological mysteries, including the flatness and uniformity of the universe. But since physicists still do not know what drove this rapid inflationary process, there remains the chance that it could happen again, in an endless cycle. This is the chaotic inflationary idea of Andrei Linde of Stanford University, in which “parent universes” bud “baby universes” in a continuous, never-ending cycle. Like soap bubbles which split into two smaller bubbles, universes can constantly sprout from other universes. But what caused the big bang and drove this inflation? The question remains unanswered. Since the big bang was so intense, we have to abandon Einstein’s theory of general relativity, which forms the underlying framework for all of cosmology. Einstein’s theory of gravity breaks down at the instant of the big bang, and hence cannot answer the deep philosophical and theological questions raised by this event. At these incredible temperatures, we must incorporate quantum theory ”the other great theory to emerge in the 20th century” which governs the physics of the atom. Quantum theory and Einstein’s relativity theory are opposites. The former governs the world of the very small, the peculiar subatomic realm of electrons and quarks. Relativity theory rules the world of the very large of black holes and expanding universes. Relativity, therefore, is not suited to explaining the instant of the big bang, where the universe was smaller than a subatomic particle. At this moment we would expect radiation effects to dominate over gravity, and hence we need a quantum description of gravity. Indeed, one of the greatest challenges facing physics is to unify these theories into a single, coherent theory of all the forces in the universe. Physicists today are groping for this “theory of everything.” Many proposals have been made over the past half century, but all have been shown to be inconsistent or incomplete. So far, the leading, in fact the only ”candidate", is string theory. The latest incarnation of string theory, M-theory, may answer a question which has dogged advocates of higher dimensions for a century: where are they? Smoke can expand and fill up an entire room without vanishing into hyperspace, so higher dimensions, if they exist at all, must be smaller than an atom. If higher-dimensional space were larger than an atom, then we should see atoms mysteriously drifting and disappearing into a higher dimension, which we do not see in the laboratory. In the older string picture, one had to “curl” or wrap up six of the ten original dimensions, leaving the four-dimensional universe of today. These unwanted dimensions were squeezed into a tiny ball (called a Calabi-Yau manifold) too small to be seen. But M-theory adds a new twist to this: some of these higher dimensions can be large, or even infinite, in size. Imagine two parallel sheets of paper. If an ant lived on each sheet, each would think that its sheet was the entire universe, unaware that there was another universe close by. In fact, the other universe would be invisible. Each ant would live out its life oblivious to the fact that another universe was only a few inches away. Similarly, our universe may be a membrane floating in 11-dimensional hyperspace, while we remain oblivious of the parallel universes hovering nearby. One interesting version of M-theory cosmology is the “ekpyrotic” (from the Greek for “conflagration”) universe, proposed by Paul Steinhardt, Burt Ovrut and Neil Turok. It assumes that our universe is a flat, infinite membrane floating in higher-dimensional space. But occasionally, gravity attracts a nearby membrane. These two parallel universes race towards each other until they collide, releasing a colossal amount of energy (the big splat). This explosion creates our known universe and sends the two parallel universes flying apart in hyperspace. At the University of Colorado in Denver, the first experiment was conducted to search for the presence of a parallel universe, perhaps only a millimeter away. Physicists searched for tiny deviations from Newton’s inverse square law for gravity. The light from a candle is diluted as it spreads out, decreasing at the inverse square of the distance of separation. Similarly, according to Newton’s law, gravity also spreads out over space and decreases in the same way. But in a four-dimensional universe, there is more room for light or gravity to spread out, so they decrease at the inverse cube of the distance. Hence, by searching for tiny deviations from the inverse square law, one may pick up the presence of the fourth dimension. Newton’s inverse square law is so precise that it can guide our space probes throughout the solar system. But no one knows if it holds down to the millimeter level. At present, only null results have been found in these experiments. Other groups are searching for even smaller deviations. Physicists at Purdue University in Indiana are trying to test the law down to the atomic level, using nanotechnology. Other avenues are also being explored. In 2007, the large hadron collider (LHC), capable of blasting subatomic particles with a colossal energy of 14 trillion electron volts (10 trillion times the energy found in a typical chemical reaction) will be turned on outside Geneva. The world’s largest atom smasher, this huge machine, 27km in circumference, straddling the French-Swiss border, will probe into places 10,000 times smaller than a proton. Physicists expect to find an entire zoo of new subatomic particles not seen since the big bang. Physicists predict that the LHC may create exotic particles like mini-black holes and supersymmetric particles, dubbed “sparticles,” which would provide indirect evidence for string theory. In string theory, every particle has a super-partner. The partner of the electron is the “selectron,” the partner of the quark is the “squark,” and so on. Furthermore, around 2012, the space-based gravity wave detector Lisa (laser interferometer space antenna) will be sent into orbit. Lisa will be able to detect the gravitational shockwaves emitted less than a trillionth of a second after the big bang. It will consist of three satellites circling the sun, connected by laser beams, making a huge triangle in space 5m km on each side. Any gravitational wave which strikes Lisa will disturb the lasers, and this tiny distortion will be picked up by instruments, signaling the collision of two black holes or the big bang aftershock itself. Lisa is so sensitive ”it can measure distortions a tenth the diameter of an atom” that it may be able to test many of the scenarios being proposed for the pre-big bang universe, including string theory. Unfortunately, the energy necessary to manipulate these higher dimensions, rather than just observe them, is far beyond anything available to us in the foreseeable future: 1019 bn electron volts, or a quadrillion times the energy of the large hadron collider. To operate here one needs the technology of a super-advanced civilization. In order to organize a discussion of advanced extraterrestrial civilizations, astrophysicists often use the classification of Type I, II and III civilizations introduced by Russian astrophysicist Nikolai Kardashev in the 1960s, who ranked them by their energy consumption. One might expect that a Type III civilization, using the full power of its unimaginably vast galactic resources, would be able to evade the big freeze. The bodies of its citizens, for example, might be genetically altered and their organs replaced by computerized implants, representing a sophisticated merger of silicon and carbon technologies. But even these superhuman bodies would not survive the big freeze. This is because we define intelligence as the ability to process information. According to physics, all machines, whether they are computers, rockets, locomotives or steam engines, ultimately depend on extracting energy from temperature differences: steam engines, for example, work by extracting energy from boiling water. But information-processing, and hence intelligence, requires energy supplied by machines and motors, which will become impossible as temperature differences drop to zero. According to the laws of physics, in a uniformly cold universe where temperature differences do not exist, intelligence cannot survive. But since the big freeze is probably billions to trillions of years away, there is time for a Type III civilization to plot the only strategy consistent with the laws of physics: leaving this universe. To do this, an advanced civilization will first have to discover the laws of quantum gravity, which may or may not turn out to be string theory. These laws will be crucial in calculating several unknown factors, such as the stability of wormholes connecting us to a parallel universe, and how we will know what these parallel worlds will look like. Before leaping into the unknown, we have to know what is on the other side. But how do we make the leap? An advanced civilization which has colonized the galaxy may have stumbled during its past explorations upon exotic, primordial left-overs from the big bang. The original expansion was so rapid and explosive that even tiny wormholes might have been stretched and blown up into macroscopic size. Wormholes, cosmic strings, negative matter, negative energy, false vacua and other exotic creatures of physics may be relics left over from creation. But if such naturally occurring gateways are not found, then the civilization will have to take more complex and demanding steps. Black holes, we now realize, are plentiful; there is one lurking in the centre of our own milky way galaxy weighing about 3m solar masses. Probes sent through a black hole may settle some unsolved questions. In 1963, the mathematician Roy Kerr showed that a rapidly spinning black hole will not collapse into a dot, but rather into a rotating ring, which is kept from collapsing by centrifugal forces. All black holes are surrounded by an event horizon, or point of no return: passing through the event horizon is a one-way trip. Conceivably, two such black holes would be needed for a return trip. But to an advanced civilization fleeing the big freeze, a one-way trip may be all that is required. What happens if one falls through the Kerr ring is a matter for debate. Some believe that the act of entering the wormhole will close it, making it unstable. And light falling into the black hole would be blue-shifted, giving rise to the possibility that one might be fried as one passed into a parallel universe. No one knows for sure, so experiments must be done. This controversy heated up last year when Stephen Hawking admitted that he had made a mistake 30 years ago in betting that black holes gobble up everything, including information. Perhaps the information is crushed forever by the black hole, or perhaps it passes into the parallel universe on the other side of the Kerr ring. Hawking’s latest thinking is that information is not totally lost. But no one believes that the final word on this delicate question has been spoken. To gain further data on space-times which are stretched to breaking point, an advanced civilization might create a black hole in slow motion. In 1939, Einstein analyzed a rotating mass of stellar debris which was slowly collapsing under its own gravity. Although Einstein showed that this rotating mass would not collapse into a black hole, an advanced civilization may duplicate this experiment in slow motion by collecting a swirling mass of neutron stars weighing less than about 3 solar masses and then gradually injecting extra stellar material into the mass, forcing it to undergo gravitational collapse. Instead of collapsing into a dot, it will collapse into a ring, and hence allow scientists to witness the formation of a Kerr black hole in slow motion. If Kerr rings prove to be too unstable or lethal, one might also contemplate opening up wormholes via negative matter/energy. In 1988, Kip Thorne and his colleagues at the California Institute of Technology showed that if one had enough negative matter or negative energy, one could use it to create a "transversable wormhole” one in which you could pass freely back and forth between your lab and a distant point in space (and even time). Negative matter/energy would be sufficient to keep the throat of the wormhole open for travel. Unfortunately, no one has ever seen negative matter. In principle, it should weigh less than nothing and fall up, rather than down. If it existed when the earth was created, it would have been repelled by the earth’s gravity and drifted off into space. This was first predicted in 1948 and measured in 1958. However, the Casimir energy is tiny proportional to the inverse fourth power of the separation of the plates. To make use of the Casimir effect would require advanced technology to squeeze these parallel plates to very small separations. If one were to reshape these parallel plates into a sphere with a double lining, and use vast amounts of energy to press these spherical plates together, enough negative energy might be generated for the interior of the sphere to separate from the rest of the universe. Another source of negative energy is laser beams. Pulses of laser energy contain “squeezed states,” which contain negative as well as positive energy. The problem is separating the negative from the positive energy within the beam. Although this is theoretically possible, it is exceedingly difficult. If a sophisticated civilization could do this, then powerful laser beams might generate enough negative energy for the sphere to peel from our universe. According to inflation, just a few ounces of matter might suffice to create a baby universe. This is because the positive energy of matter cancels out the negative energy of gravity. If the universe is closed, then they cancel out exactly. In some sense, the universe may be a free lunch, as Guth has emphasized. Strange as it may seem, it requires no net energy to create an entire universe. Baby universes are in principle created naturally when a certain region of space-time becomes unstable and enters a state called the “false vacuum,” which destabilizes the fabric of space-time. An advanced civilization might do this deliberately by concentrating energy in a single region. This would require either compressing matter to a density of 1080 g/cm3, or heating it to 1029 degrees kelvin. To create the fantastic conditions necessary to open up a wormhole with negative energy or to create a false vacuum with positive energy, one might need a “cosmic atom-smasher.” Physicists are attempting to build “table-top” accelerators that can, in principle, attain billions of electron volts on a kitchen table. They have used powerful laser beams to attain an energy acceleration of 200bn electron volts per meter, a new record. Progress is rapid, with the energy growing by a factor of ten every five years. Although technical problems still prevent a true table-top accelerator, an advanced civilization has billions of years to perfect these and other devices. To reach the Planck energy (1028 eV) with this laser technology would require an atom-smasher ten light years long, beyond the nearest star, which would be well within the technological capabilities of a Type III civilization. Since the vacuum of empty space is better than any vacuum attainable on the earth, the beam of subatomic particles may not need light years of tubing to contain it; it could be fired in empty space. Power stations would have to be placed along the path in order to pump laser energy into the beam, and also to focus it. Another possibility would be to bend the path into a circle so that it fits within the solar system. Gigantic magnets could be placed on asteroids to bend and focus the beam in a circular path around the sun. The magnetic field necessary to bend the beam would be so huge that the surge of power through the coils might melt them, meaning that they could only be used once. After the beam had passed, the melted coils would have to be discarded and replaced in time for the next pass. In principle, it might be possible to create laser beams of limitless power; the only constraints are the stability of the lasing material and the energy of the power source. In the lab, terawatt (trillion watt) lasers are now common, and petawatt (quadrillion watt) lasers are slowly becoming possible (in comparison, a commercial nuclear power plant generates only a billion watts of continuous power). One can even envisage an X-ray laser powered by the output of a hydrogen bomb, which would carry unimaginable power in its beam. At the Lawrence Livermore National Laboratory, a battery of lasers is fired radially on a small pellet of lithium deuteride, the active ingredient of a hydrogen bomb, in order to tame the power of thermonuclear fusion. An advanced civilization might create huge laser stations on the asteroids and then fire millions of laser beams on to a single point, creating vast temperatures and pressures unimaginable today. If the wormholes created in the previous steps are too small, too unstable, or the radiation effects too intense, then perhaps we could send only atom-sized particles through a wormhole. In this case, this civilization may embark upon the ultimate solution: passing an atomic-sized “seed” through the wormhole capable of regenerating the civilization on the other side. This process is commonly found in nature. The seed of an oak tree, for example, is compact, rugged and designed to survive a long journey and live off the land. It also contains all the genetic information needed to regenerate the tree. An advanced civilization might want to send enough information through the wormhole to create a “nanobot,” a self-replicating atomic-sized machine, built with nanotechnology. It would be able to travel at near the speed of light because it would be only the size of a molecule. It would land on a barren moon, and then use the raw materials to create a chemical factory which could create millions of copies of itself. A horde of these robots would then travel to other moons in other solar systems and create new chemical factories. This whole process would be repeated over and over again, making millions upon millions of copies of the original robot. Starting from a single robot, there will be a sphere of trillions of such robot probes expanding at near the speed of light, colonizing the entire galaxy. Next, these robot probes would create huge biotechnology laboratories. The DNA sequences of the probes’ creators would have been carefully recorded, and the robots would have been designed to inject this information into incubators, which would then clone the entire species. An advanced civilization may also code the personalities and memories of its inhabitants and inject this into the clones, enabling the entire race to be reincarnated. Although seemingly fantastic, this scenario is consistent with the known laws of physics and biology, and is within the capabilities of a Type III civilization. There is nothing in the rules of science to prevent the regeneration of an advanced civilization from the molecular level. For a dying civilization trapped in a freezing universe, this may be the last hope.